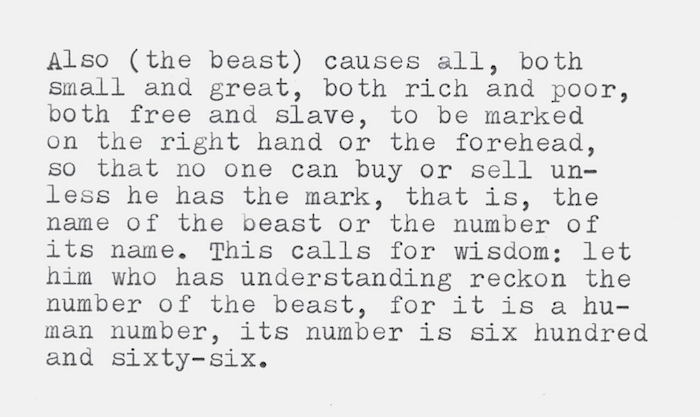 The number of the beast is found in Revelation 13: “This calls for wisdom: let the one who has understanding calculate the number of the beast, for it is the number of a man, and his number is 666” (Rev. 13:18, ESV). There is little scholarly agreement as to the meaning of the number, though presumably ancient Christians understood its significance. Some scholars suggest the number is a cryptogram, representing one or more of the Roman emperors. Nero, whose name in Hebrew has a numeric value of 666, is a good candidate, except that the book of the Revelation was written in Greek. Others argue the number is symbolic, signifying humankind (think the tower of Babble).1 Whatever its meaning, it’s not a good name for a typewriter. But, it is a nice typer. The associated meaning of “666” is unfortunate. “Three sixes” might be an apt name for moonshine, but hardly for a typewriter. Certainly, the religious sensibilities of at least some consumers were troubled. The Remington 666 follows the 333, so one can understand the company’s logic. (I checked, there does not appear to be a 999 — I was hoping for a triptych.) Both machines are rebranded Brothers — Brother dominated the industry in the 1960s and 1970s. The 333 is identical to the Webster XL-500 (a Brother machine offered by the Webster department chain2), and the 666 is identical to the Brother Opus 895, and nearly identical to the Activator 899 and Valiant 391 (the latter machines have repeat spacers). Within a product line, numbering indicates improvement, but across lines, it is irrelevant. Update: The 666 sold from 1968 to 1970, several advertisements are listed below. 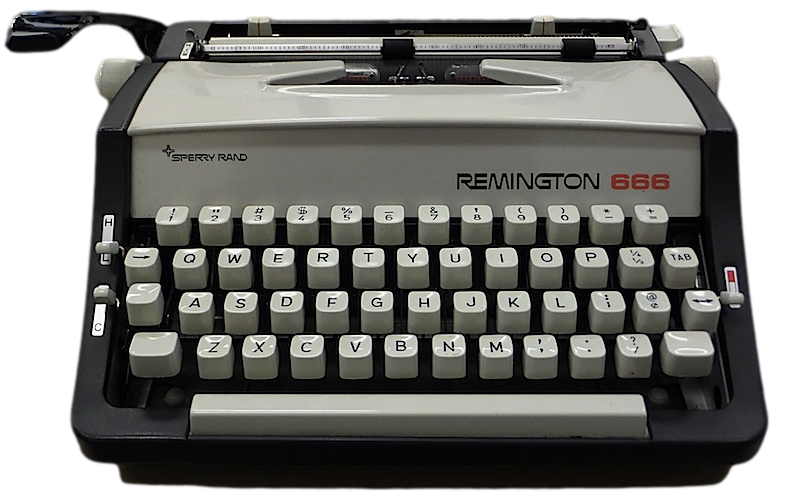 In general, it seems typewriter manufactures in the late 1960s and the 1970s preferred numbers over names. Perhaps a number suggested progressiveness. 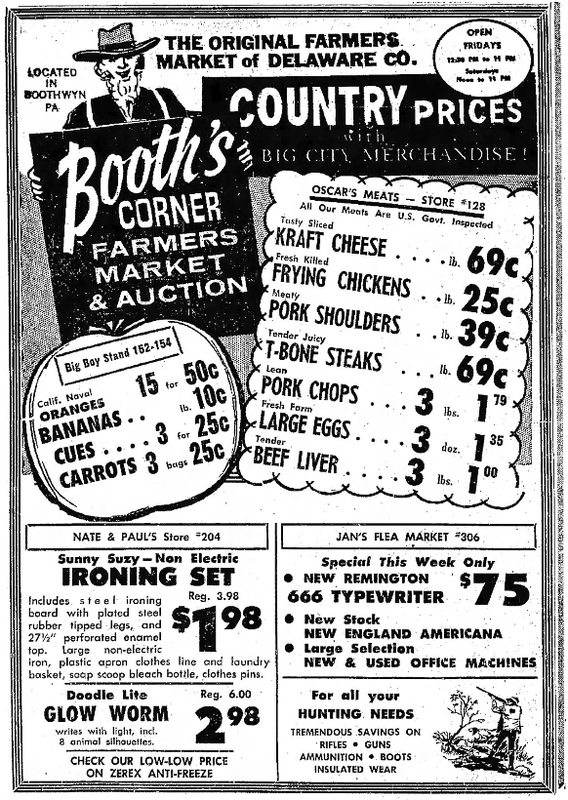 Perhaps consumers had grown tired of Travel-Rite, or Office-Rite, or Quiet-Rite, (or anything with “rite” in it) and were excited by ever increasing numeric values. I suspect also that manufactures favored digits because improvement could be more easily suggested. Yes, you can buy the 333, but have you seen the 666? As near as I can tell, 333 and 666 were randomly chosen numbers, having no inherent meaning. I might have suggested 777 instead. Who knows, Remington might have gotten lucky with that number. As a typewriter, I’m fond of the 666. For that matter, I’m fond of many of the Brother typewriters. Generally speaking, they are light-weight machines, good typers, and stylish (in a sixties/seventies sort of way). And these machines rarely set the collector back much, being relatively contemporary and extraordinarily common. Brother typewriters, and rebranded siblings, number in the millions. My 666 (with case and manual) cost $40 on eBay, shipping included. There is more I could say about these typewriters, but Robert Messenger at oz.Typewriter handles the subject more comprehensively than I can. Read ああ姉妹、どこアートなた The Brother Typewriter Story. Seems there are many numbers in the Remington line: 333, 600, 611, 612, 666, 700, 711 and 713. Apart from the 333 and the 666, these appear to be electrics. I am curious to know what arrangement Remington had with Brother. I’d also like help dating my 666s, which I gather were manufactured in the late sixties or early seventies. If anyone has found an advertisement for the 666, please send a copy to netadams @ gmail. Thanks. Updated Jan. 27, 2014. Found several advertisements. From the Delaware County Daily Times of Chester, Pennsylvania – Nov 28, 1968. The Post-Standard of Syracuse, New York – Dec 15, 1968. From The Post-Crescent of Appleton, Wisconsin – Jan 23, 1969. From The Post-Crescent of Appleton, Wisconsin – Apr 25, 1969. From The Times of San Mateo, California – May 26, 1969. From the Valley News of Van Nuys, California – March 6, 1970. 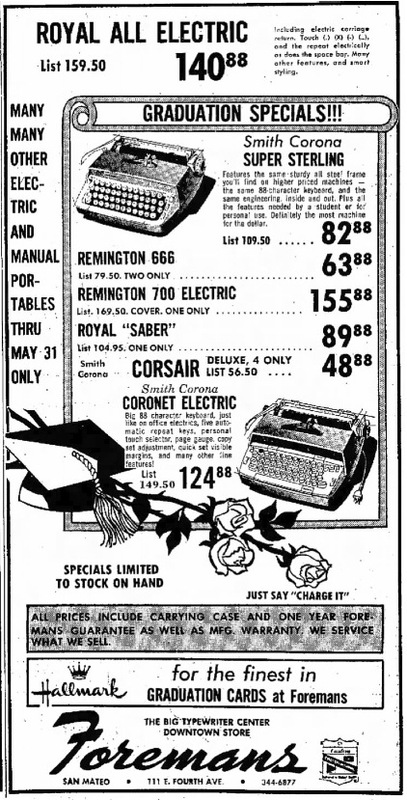 I almost bought that typewriter last year for the novelty of its name alone. … whereas in my user’s manual for the Webster (Brother), the hands look like little fetal blobs! “L8” is going to be either a Dec 1968 or Dec 1978 model (there’s a month and year code but no decade code in Brother serial numbers). I would guess 1968. Yes, 1968 seems logical. 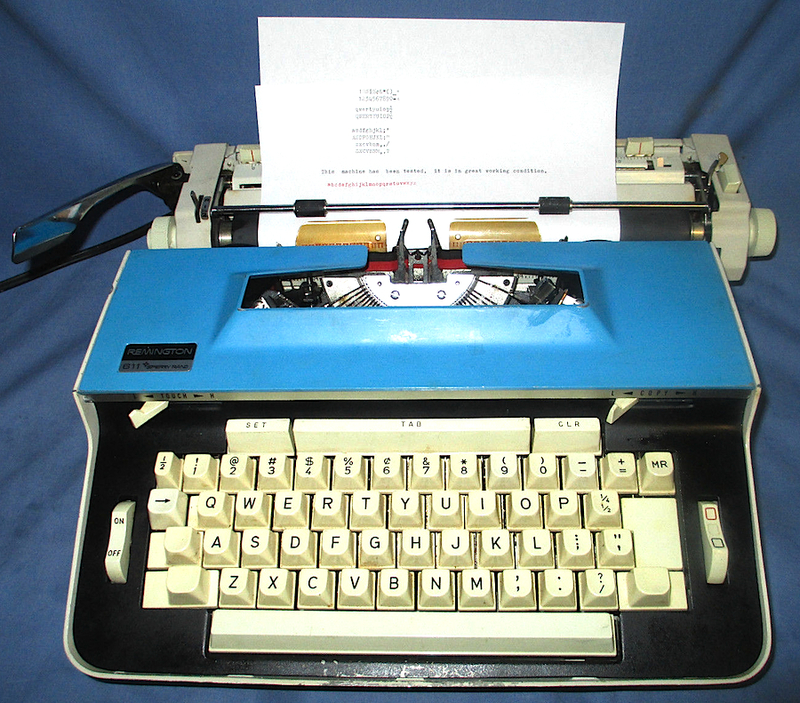 Someone on the Yahoo message group remembers seeing this typewriter in the late 1960s. 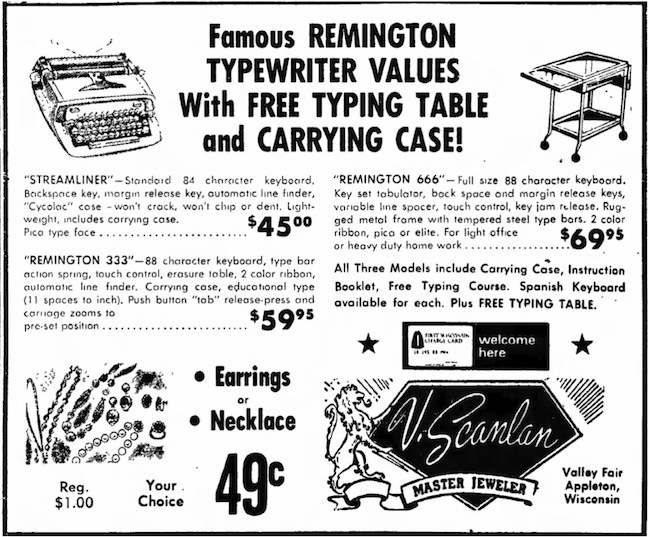 Would the 333 and the 666 be among the last Remington-branded typewriters? Well, Remington was selling Ten-Fourty’s and Envoys up to at least 1973 (Dutch made?) and transitioned to “Sperry-Rand” with those. I think I’ve seen mention of Brother-made Sperry-Rands as well. They may have been offered concurrently for different markets or price points. It would be interesting to see Remington ads offering both in the 70’s. 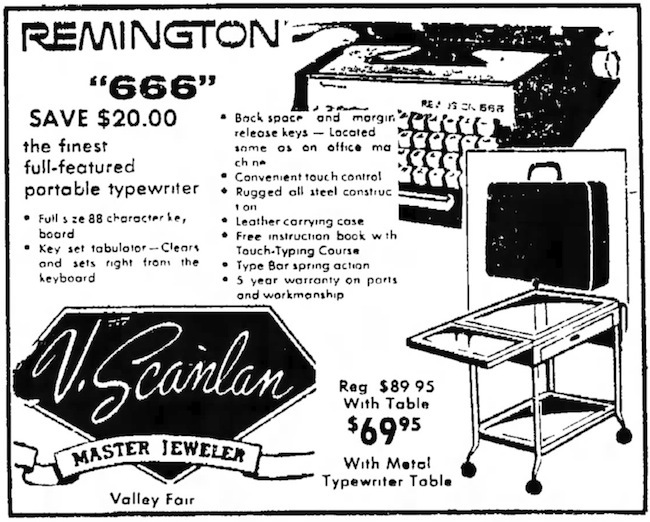 I wonder if those hideously devilish fingers have anything to do with the machine’s name? I had one of these for a while that some poor soul dumped on me as soon as they learned I collect these little guys. Hated it, really. Never “got” its weird action. Besides it came in an amazingly small typestyle that fit 120 characters to the line in a normal-width platen! Almost unreadable. I gave it to my local friendly antique dealer with the compromise on his part to find it a good home. After all, he’s found a good home for half of MY typewriters (and given me some very good deals too), ha! Personally, I can’t help but wonder if the graphics were produced in jest! Someone must have noticed the unfortunate name for this machine. The market for Brother typewriters is fluid. Can’t offer much help here. Ok, your Remington 611 is a Brother JP-4 for sure. It’s the first JP-4 I’ve ever seen. The Remington 700 is almost certainly a Brother JP-2, but I’d need to see better pics of it to be sure. Also, when you do that, and can I use the photo thumbnails to represent these JP categories on the new Brother page? A new Brother page? Great. Yes to the images. P.S. The 611 is not mine, just an image I gleaned from the Internet. Also, known variants for the 1961 model also include the Bradford. Just purchased one for my 8-year old daughter. Any idea where to get ribbons? This is great website. I will definitely bookmark and share this with her.